Apple vs. Samsung: What’s an Idea Worth? The Jury didn't award Apple over a billion dollars in its suit against Samsung because Apple discovered a new technology. Phones that play songs were not new. Phones that have email or text messaging were not new. Phones that have games were not new. Touch screens were not new. What Apple did with the iPhone was create a phone that was fun and easy to use. They didn't do it with a complicated looking, bulky device. They made the iPhone simple and intuitive. Steve Jobs demanded a product from his engineers that not only looked beautiful, but also worked beautifully. He once said, “Design is not just what it looks like and feels like. 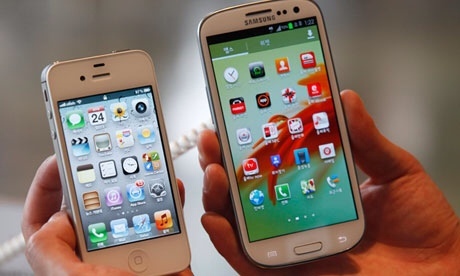 It is how it works.” In the end, the jury ruled that the look and feel of the iPhone, something known as “trade dress”, as well as “how it works” was illegally copied by Samsung. Trade dress is not a new thing. A Hershey bar's unique brown and silver wrapper is protected by law, just as the shape of a Coke bottle and the Nike swoosh. In the case of Apple, the rectangular icons with the curved corners, the shape of the product, and the finger movements used to operate the iPhone all belong to Apple. The really big news here is not the billion dollars that Samsung now owes Apple, and it's not even the possibility that some Samsung and Android products might be removed from the market. The really big news is that an industry that has been built on stealing ideas and copying them with impunity will need to re-assess its practices. The new mantra will become innovation, not imitation. While this verdict will certainly not cause Samsung to cut and run, the long term effect will be that competitors will need to pay royalties for their mimicry, or they will need to learn to take risk and innovate. This entry was posted in Business and tagged Apple, ideas, improvement, innovation, invent. Bookmark the permalink.